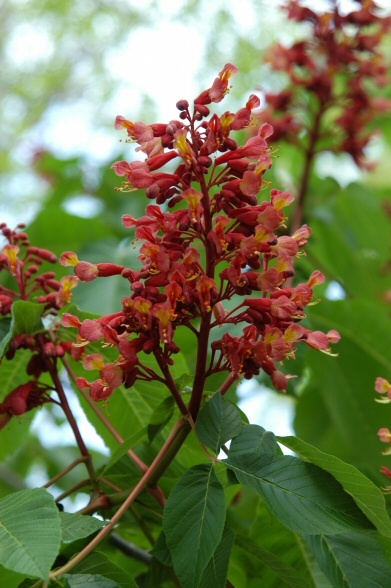 NATURAL HABITAT AND PREFERRED SITE: Red buckeye is a large shrub or small tree usually growing as an understory tree in forests or thickets along streams in East and Central Texas. It shows up in the acid soils of the Pineywoods and is found growing as far west as the Edward’s Plateau. At home grow it as an understory plant in well-prepared soil with filtered morning sun and afternoon shade. IDENTIFICATION INFORMATION: Scarlet buckeye is a beautiful little tree that has compound leaves with five leaflets and bright red flowers early to late spring. The plant generally goes dormant and loses its leaves in mid summer. The defoliation seems to be less severe in partially shaded conditions. This photograph was taken in the Lakewood area of Dallas in black and white soils. FLOWERS AND FRUIT: The flowers form in the spring - usually March to May – in showy red clusters. The fruit is a one to two inch capsule, light brown with one to three flattened or rounded seed. BARK: Light gray to brown, very smooth on young branches but older trunks will roughen and become flaky. FOLIAGE: The leaves are compound, deciduous, usually five leaflets sometimes having only three. The leaves commonly drop in mid summer during a dormant season caused by the heat. This leaf drop is also reported to be partly due to a disease. CULTURE: Red buckeye is fairly easy to grow in well-prepared soil in morning sun or filtered light and requires a moderate amount of water and low amounts of fertilizer. The premature summer drop of foliage can possibly be eliminated with an intensely maintained organic program and the use of whole ground cornmeal. PROBLEMS: Premature summer drop of foliage and foliage burn in full sun situations. If the leaf drop is due to disease organisms, cornmeal will reduce or eliminate the problem. PROPAGATION: Buckeyes germinate easily from fresh untreated seed. Roots will sometimes emerge from seed while in storage. There’s no need for any pretreatment. Seed should be planted immediately after collection and will germinate 3 to 30 days. The first season or two will be spent developing root systems so don’t expect to see much topical growth. I have a small scarlet buckeye in my front garden that is not yet 18 inches tall. It was planted four years ago. Buckeyes can also be grown from root cuttings, taken in late winter just before the new growth emerges. This is also a time to try stem cuttings, kept in moist potting soil and very humid environment. 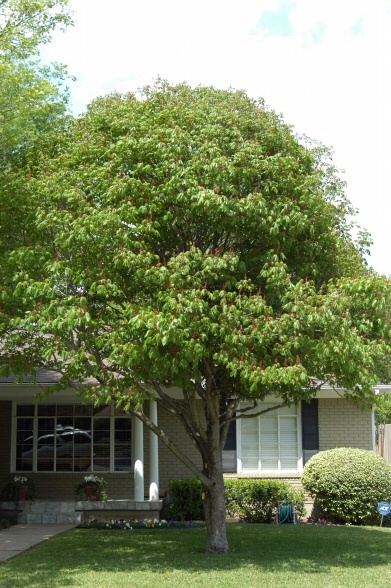 INSIGHT: Scarlet buckeye is a very beautiful small tree that should be used more.